For the third year in a row, a few days before the 60th Eurovision Song Contest takes place in Vienna, Athens will celebrate a big Eurovision Concert with lots of Eurostars performing live. 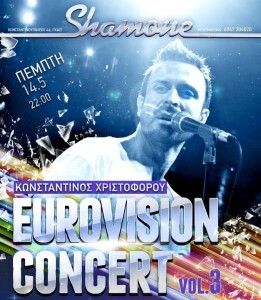 Shamone Club will host the Eurovision Concert vol. 3 on the 14th of May. Konstantinos Christoforou (Cyprus 1996, 2005) will be again, as previous years, the main artist of the concert and this time he will be joined on stage by some of the most favourite Greek and Cypriot Eurostars such as Eleftheria Eleftheriou (Greece 2012), Sophia Vossou (Greece 1991), Elena Patroklou (Cyprus 1991), Evridiki (Cyprus 1992, 1994, 2007), Konstantina (Cyprus 1983), Despina Olimpiou (Cyprus 2013) and the journalist Daphne Bokota who was the ERT commentator for Eurovision until 2004. All those who will attend the event will get into Eurovision mood a week before the first semi-final starts in Vienna. The show will start at 22:00 local time and tickets can be bought at the venue.